This is a follow-up to my first FAKE post “FAKE: Building C# projects without knowing a tiny bit of F#”. We start with a simple test project, which is basically a normal library project, and add xUnit via NuGet. 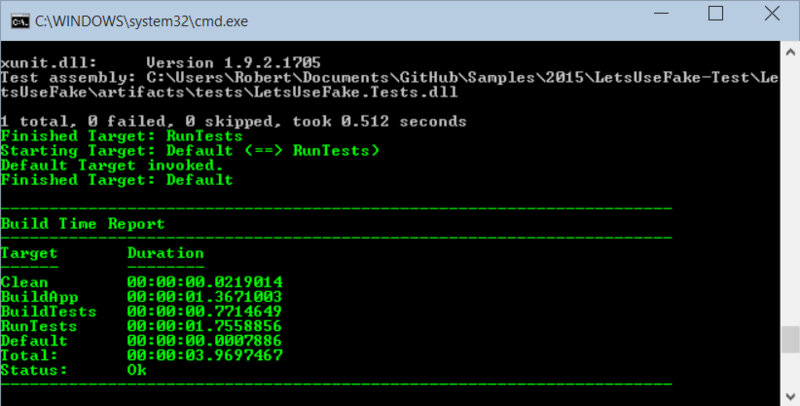 Next we need the xUnit runner (to run the tests…), which can be installed via NuGet on the Solution Level. This path is now used in the build target. With this call I build all projects that ends with Tests.csproj. The last change is the Build-Dependency-Graph, which now contains the steps for building the test project and run the tests. In this demo FAKE will build the test project two times, but in real life I would split the source and the test projects in different directories to get a more granular control what I want to build. Package "FAKE" is already installed. 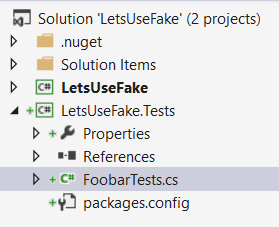 C:\Users\Robert\Documents\GitHub\Samples\2015\LetsUseFake-Test\LetsUseFake\.nuget\nuget.exe  "install" "C:\Users\Robert\Documents\GitHub\Samples\2015\LetsUseFake-Test\LetsUseFake\.nuget\packages.config" "-OutputDirectory" "C:\Users\Robert\Documents\GitHub\Samples\2015\LetsUseFake-Test\LetsUseFake\packages"
C:\Users\Robert\Documents\GitHub\Samples\2015\LetsUseFake-Test\LetsUseFake\.nuget\nuget.exe  "install" "C:\Users\Robert\Documents\GitHub\Samples\2015\LetsUseFake-Test\LetsUseFake\LetsUseFake.Tests\packages.config" "-OutputDirectory" "C:\Users\Robert\Documents\GitHub\Samples\2015\LetsUseFake-Test\LetsUseFake\packages"
Copyright (C) 2013 Outercurve Foundation.